The Ponte di Rialto (Rialto Bridge) is the oldest bridge in Venice, and divided the districts of San Marco and San Polo. Beautiful doors set against the Ponte di Rialto. My deep fascination for Gondola's was hardly even documented, I could have taken a million of these shots but I only took a few hundreds (hehe). They are just way to beautiful in details and look so beautiful on pictures that it becomes hard not to want to snap several of them when you run into them. 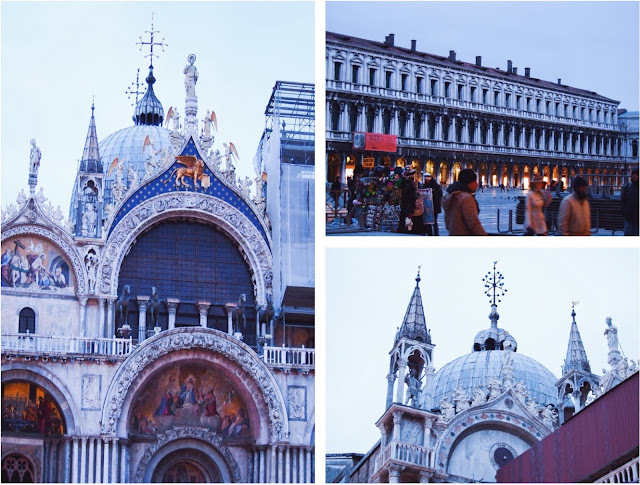 | LEFT x BOTTOM RIGHT | Basilica Cattedrale Patriarcale di San Marco (St. Mark's Basilica) at sunset is as magical as it is in the light of the glistening sun. | TOP RIGHT x BELOW | Piazza San Marco (St. Mark's Square) during the last hustle and bustle hours of the evening. I love this moment I captured, as a nun walks into this building. It has such a dramatic look and almost gives off this sense of mysticism. Here I go again with my gondola obsession, this is one of my favorite shots I took in Venice, gondolas at night facing the Saint Mark Basin. More romantic of a scene than this, I don't think I can find. Built in 1600, Ponte dei Sospiri (Bridge of Sighs) passes over the Rio di Palazzo and connects the Prigioni Nuove (New Prison) to the interrogation rooms in the Palazzo Ducale (Doge's Palace). This bridge was the last view that convicts got to see of Venice before their improvement. The bridge's name was given by Lord Byron (an English poet) in the 19th century, suggesting that prisoners would sigh at their final view of Venice through the windows as they were taken to their cells. There is also a local legend that says that if lovers would kiss in a gondola at sunset under the Ponte dei Sospiri while the bells of Campanile di San Marco (St. Mark's Campanile) would chime, they would be granted eternal love and bliss. This legend served as part of the plot line for the movie Little Romance. Hope you enjoyed part II of a Girls Trip to Italy ~ Venice, incase you missed part I, see it HERE. How nice I miss Venice!